Course description: Discover creating raised patterns in metal without any special equipment! This is the full meal deal. Meredith will cover everything from transferring images onto metal to etching a variety of alternative metals using a low toxic and safe method. 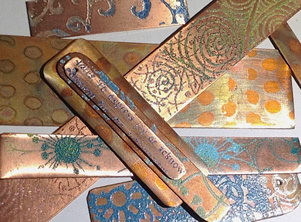 The results are a beautiful bracelet and the knowledge for how to make your own unique texture sheets or patterned metal for signature designs. Class covers a variety of resist processes including different heat transfer methods, ink transfer techniques and free hand solutions. Drilling, filing, refining, and a variety of polishing and sealing methods will also be covered. Materials: Kit fee(paid to instrucotor in class): $40 includes red brass, wire, booklet on etching, etching solution and tank, neutralizing bath, transfer film, inks, and more. Each student will take home everything they need to continue metal etching at home. Instructor will supply hot plate, hammers, drills, pliers, etc. for use in class. Students Should Bring: rubber stamps if you have some small patterns you especially like (please put your name on your stamps). 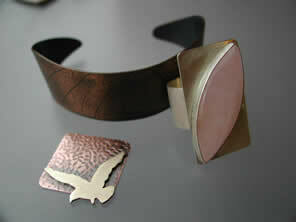 Course description: In this class you will learn how to work with copper sheet metal and silver precious metal clay! Ruth will start by showing how to work with the sheet: cutting, texturing and forming. Then, she will show how to work with the metal clay : you will learn proper handling, texturing, finishing and how to torch fire your piece. The next step is learning about riveting and cold connections. This involves the proper way to drill holes or cut tabs to secure the two pieces into one beautiful work of wearable art. 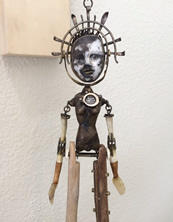 Ruth will also show you how to polish and add an oxidized patina for depth and contrast. Materials Fee: $45 kit fee paid to instructor in class (cash/check preferred) 15g PMC3 metal clay, copper sheet, rivets and use of all tools needed to make and finish your project. Course description: Learn all about rivets in this fun one day class! Rivets are a great solution whenever solder is not an option. Glenda will cover standard rivets, flush rivets, tube rivets, all kinds of rivets! Learn to make rivets with spacers for a shadow box effect. 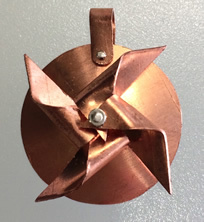 And, you'll learn step by step how to make a spinning pin wheel pendant, no soldering necessary! Whether you want to incorporate found objects such as glass and wood, or add movement to your pieces, or just add another technique to your metalsmithing tool box, you'll love rivets! Materials: Copper and brass provided, students may opt to bring silver to work with. Optional to bring, found object to incorporate into projects. 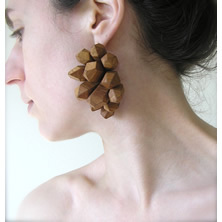 Prerequisite: Beginning Jewelry or equivalent. Students should know how to saw and file. Course description: Whether you're presenting, applying, publishing, or posting, your work is only as good as your documentation. Perfect for jewelery and other small scale 3-d art objects, this workshop focuses on simple strategies for taking consistently strong pictures. Julia will show you how to take great photos by managing light and shadows using cheap, portable diffusers and reflectors; staging still life photos and working with models; developing a personal and appropriate style; and using accessible software to refine your images. Materials: $15 material fee paid to instructor in class (cash/check only please) covers a small kit of background material, diffuser and reflector that you will take home after the class. Bring a digital camera you're familiar with (or smartphone with camera) and samples of your jewelry or other small objects. 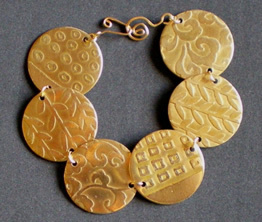 Course description: Learn the basics skills needed to create jewelry of your own design. We will use a jeweler's saw, rolling mill, hammers and mallets, and torches to cut, texture, shape, and solder metal sheet and wire into unique jewelry pieces. Possible projects include things like cuff bracelets, textured earrings, and a ring or pendant with a bezel-set cabochon stone. Materials: Copper and brass included. 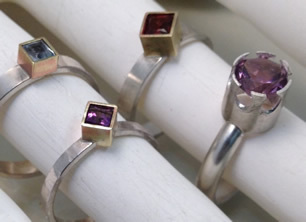 Students may buy silver and stones from instructor for ring project, or bring their own. Course description - An in-depth workshop in three days, perfect for anyone who has always wanted to learn jewelry-making but never had the time. The instructor will cover all of the metalsmithing fundamentals, including sawing, filing, stamping, hammering, and texturing, and that is just the first day! We will also cover bezel setting stones, making rings, and lots of soldering. Students will be guided step by step in the use of studio equipment like torches, hand tools, and rolling mill.. The instructor will also talk about how to set up a home studio so you can continue on your own after the class. No prior jewelry experience is necessary, students of all levels are welcome. Small class size ensures plenty of one on one instruction. Copper and brass provided for in class use, silver available for purchase. Materials: $60, payable to the instructor (cash/check only). 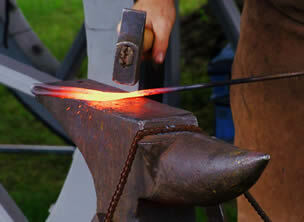 Each student has his/her own forge and anvil to work with during the class. Students should bring safety glasses and leather work gloves. 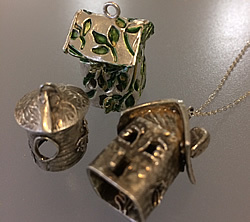 Course description: Learn to design and make jewelry using the lost wax casting method. Students will be guided step by step in the process in order to make unique pieces of jewelry. You will design and learn to carve a model in wax, and then replicate your model in silver or bronze using lost wax casting. The first day you'll be guided step by step through carving a wax model and making a mold of it. On day two, you will cast your project into bronze, or silver using centrifugal casting. Then, Jennifer will show you how to clean up and polish your project into a beautiful piece of jewelry! Demonstrations will be geared toward completion of the ring project; students may opt to work on a different project. Materials Fee: includes most materials, N95 dustmask and ancient bronze casting grain. Students who wish to work in sterling silver should bring clean silver scrap or casting grain. Prerequisite: Beginning jewelry or equivalent. Students should know how to saw, solder, file and polish metal. Course description: Learn to create quick and easy relief in thin sheet metal using minimal tools. 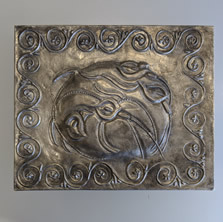 Unlike traditional repousse, Glenda will show you how to make relief designs in sheet metal using small hand tools. 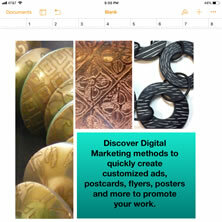 In this class you can make a decorative tile, plaque, or other ornamental item. Bring an image of your choice or use one of ours, and learn to coax wonderfully complex dimension out of thin sheet metal. Materials: fee covers copper and aluminum, tool kit and embossing pad to take home. 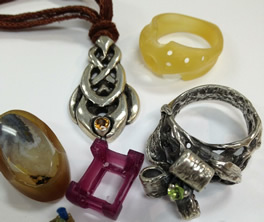 Course description: In this informal class you will learn to design and make jewelry using the lost wax casting method. Joni will help you take your design and teach you to carve your model in wax. Then you will be guided through how to make a mold. 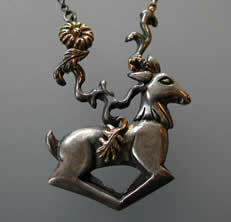 Then, replicate your model in sterling silver or ancient bronze using centrifugal casting. Students will be guided step by step in the process in order to make unique pieces of jewelry. Upon request the instructor will also cover vacuum casting and making rubber molds of your finished piece so you will have production options for making multiples. Materials: Students should bring sterling casting grain or scrap and a dust mask rated P100 or N95. Ancient bronze casting grain is included. Course description: A great starter class for absolute beginners. Learn to design and make your own jewelry step by step! Amy will cover many metalsmithing fundamentals, including sawing, filing, stamping, hammering, soldering and texturing. Students will be guided step by step in the use of studio equipment like torches, hand tools, and rolling mill. No prior jewelry experience is necessary, students of all levels are welcome. Materials included: Copper and brass provided for in class use, silver available for purchase. Course description: Learn to set round faceted stones in flush and tube mounts, it's not as hard as you think!. Learn the tricks with the flex shaft to set stones quickly and easily. We will practice with 2 mm - 3 mm faceted round stones. Prerequisite: Beginning Jewelry or previous metalworking experience. Materials: Price includes copper sheet, silver tube & cubic zirconium stones, additional silver available for purchase. Or, you can bring a project to set your stone into. Course description: This fun class is packed with a variety of creative techniques for applying color to metals. Working with copper, students will explore cold fusion techniques working with different resins for “Fauxnamel” effects, colored pencils, new patina methods, flame painting and more. The options are endless with the beauty of cold fusion color! Do you have a torch you have never used? This is the perfect class to get comfortable with some simple torch techniques on how to do flame painting on copper with guidance from Meredith. She will even share her tips on how to seal the colors! You can even create multiple layers of color on color by combining techniques. 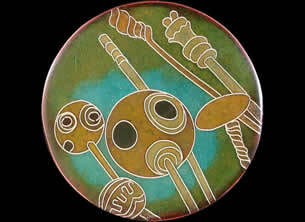 Materials: $10 paid to instructor in class covers copper and coloring/patination materials during class. 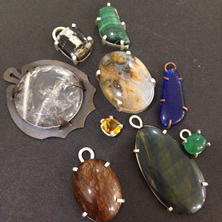 Course description: Learn how to create settings for flat backed objects and cabochon cut stones. Bezel setting is also perfect for setting beach glass, coins, buttons, almost anything! In this class we will cover selecting appropriate bezel wire, silver soldering, fitting irregular and freeform objects, making a ring band or pendant bail, polishing and stone setting. You will be able to finish a ring or pendant. Materials: Bring a stone or object to set or purchase one from our assortment. Students should bring $10-$20 to cover the cost of silver. Course description - An in-depth workshop in three days, perfect for anyone who has always wanted to learn jewelry-making but never had the time. Amy will cover all of the metalsmithing fundamentals, including sawing, filing, stamping, hammering, and texturing, and that is just the first day! We will also cover bezel setting stones, making rings, and lots of soldering. Students will be guided step by step in the use of studio equipment like torches, hand tools, rolling mill and hydraulic press. The instructor will also talk about how to set up a home studio so you can continue on your own after the class. No prior jewelry experience is necessary, students of all levels are welcome. Small class size ensures plenty of one on one instruction. Copper and brass provided for in class use, silver available for purchase. Course description: If you've taken the beginning class and want to improve on your skills then this course is for you! Intermediate Jewelry/Metals allows students to hone their soldering, fabrication and finishing skills while learning stone setting techniques. 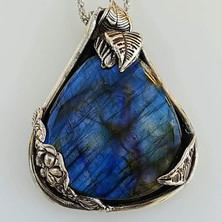 Jennifer will cover how to create various prong settings from wire for setting faceted or cabochon stones as well as unusual stone shapes and found objects. She will also share her tips and tricks for soldering success. You will also learn great ways to use the flex shaft for setting, finishing and more! Small class size of only eight students ensures plenty of one on one instruction. Materials: Included: Copper and sterling wire in 20-16 gauge round, square and half-round wire and 20 - 16 gauge copper and brass sheet. Bring your own stones or choose from our assortment. Course description: Who doesn’t love tiny little homes to hold our imagination, and tiny friends! This Precious Metal Silver project has many ‘hidden’ construction secrets housed inside the designing and making of these sweet little homes. They make the cutest charms, pendants or earrings! Design them to remember a wonderful magical trip or to house a new fairy friend that you got for the holidays! With 25g of PMC3 each student should be able to build at least 3 to 4 pieces depending on the size. Materials: Purchased from the instructor in class(Cash or check only please): Silver Clay kit: $60 PMC+ 25g clay, or Kit fee $10 if supplying your own PMC3 clay. Prerequisite: No prior jewelry experience is necessary, but students of all levels are welcome. Course description: In this informal workshop experimentation will be the theme! Jennifer will show you exciting new possibilities for adding unusual materials into your jewelry and artwork. Learn to use diamond burs and other accessories for the flex shaft to carve, shape and modify stones, shells, glass, ceramics, enamels, bones, cabochons, almost anything! Once you've made adaptations and modifications to your materials, Jennifer will help you incorporate them into jewelry or sculpture. Learn to use cold connection methods and which types of adhesives are appropriate for what materials. Safety issues of working with these materials will be addressed as well. Bring your treasures and unusual finds and be ready for inspiration! Each student will be given a diamond bur set to use during class and to take home with them. Materials: Students should bring any and all unusual materials and found objects they would like to learn to work with. Copper and brass provided, students may bring silver to work with if they wish. Prerequisite: Basic metalsmithing skills or beginning jewelry. Course description: In cloisonné enamel, fine lines of silver wire create patterns and images. The patterns are then filled with vibrant colors of glass fused to the surface through firing. In this class Jean will show you how to create a design with wires as well as tricks for how to bend and apply the cloisonné wires. Jean will also show how to create patterns with mesh and silver foil and gold leaf. Learn the process step by step including how to achieve a matte finish or a high polish on the glass surface. You will leave the class with a new creation- a gemlike 'cabochon' suitable for setting in jewelry or metalwork. Students should easily finish one or two projects (and possibly a third!). 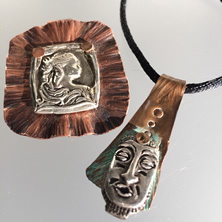 Materials fee: $45 (collected with tuition) includes enamels, 18g copper shapes, cloisonné wires, silver foil and gold leaf, and tools to share. Optional to bring: fine point watercolor paintbrushes, manicure scissors, fine point tweezers, paper and pencil for designing. Course description: Learn to use gold-filled wire and solid gold wire to create stunning stacking rings. Jennifer will show you how to work yellow and pink gold-filled wires of different shapes and gauges to create stunning rings. Get the rich look of gold without the cost! You'll learn how to measure, solder and shape the metal, then learn different ways to finish your rings: hammered, plain, matte finish or high shine! Jennifer will also talk about how to work with solid gold. 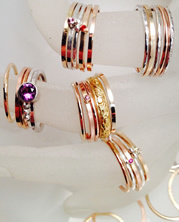 Make a set of stacking rings for yourself, or to give as gifts. Jennifer will also show a great trick for adding a tiny tube set stone! Materials: Students may bring 14/20 pink or yellow gold-filled wire in different shapes and gauges (2-3" is enough for one ring), and 10K or 14K yellow gold solder (hard, medium or easy), or purchase enough for their projects in class-approximately $10 - $30. Optional-1.5 mm round faceted stones. Students may opt to bring solid 14K gold to work with. Prerequisite: Beginning jewelry or equivlent. Course description: Ready to explore some interesting stone setting options? Then this class is for you! Jennifer will demonstrate a variety of simple stone settings that look complicated. Learn how to use tubing to create glorious prong settings for round or square gems! Jennifer will also demonstrate how to create gorgeous flared tube settings, and glamorous crown settings. These techniques are perfect for adding a bit of dazzling flash and details to a ring, earrings or necklaces, using faceted or cabochon stones! Even if you've never set a stone before you can take this class. Materials: Includes silver tube and cubic zirconium stones. Additional silver available for purchase. Optional: bring a ring or other pieces to solder your settings onto. Prerequisite: Beginning jewelry class. Students should have some experience sawing and soldering. Course description: A picture is worth 1000 words, right? Learn how to quickly create stunning visuals to capture attention for anything you want whether it's an event, your art work or a special cause. Discover a virtual graphic designer in a box! Capture your audience’s attention just by doing something so fun that it all feels like play. No previous experience is required except for a basic understanding of using a computer mouse or mobile device and your desire to learn something new. Bring your own mobile device or bring just note taking materials and expect maximum fun and lots of content in this class. Materials: Bring your own mobile device or bring just note taking materials and expect maximum fun and lots of content in this class. Prerequisite: none, this is a class for students of all levels of experience and all types of artists. 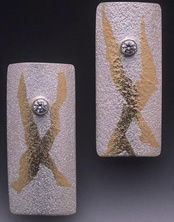 Course description: Simply stated, the enameling raku process parallels the clay raku process with some adjustments made for the differences in the materials. Experimenting with raku-fired enameling and the use of vibrant color is an exciting process. The random, unpredictable results of the raku are beautifully colored! In this class you will learn a different--or more literally, an extended--enamel firing technique. The raku-firings process is thrilling; hot enamels are plunged into burning leaves or pine needles to create lovely glassy, metallic-luster surfaces. Jean will show the raku firing process using leaves, pine needles and wet paper to get special metallic effects. 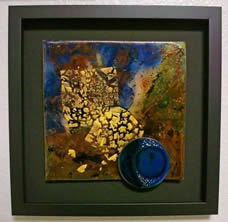 We will study how these dynamic pieces are best used, whether as stand alone works or as background for other enamels. Learn to incorporate this unpredictable process into your work with beautiful results. Materials: $30 fee paid to instructor in class (cash/check only) for copper (3 tiles - 4x4" 18g and 1 small round dish - 3 1/2" diameter x 1/2" deep) and enamels used during class. Students should bring a bag lunch both days. Optional to bring are additional misc. copper shapes of 18g sheet. Location: This class will be held at the instructor's Edgewood, WA studio (about 12 miles east of Tacoma) The exact address provided with registration. Course description: The majority of cabochons can not be fired in the Precious Metal Clay. This class will show you how to create settings to accommodate those stones and to have the freedom to use wonderful freeform stones, sea shells and other interesting pieces that would be destroyed in the firing process. Students should bring a flat back cabochon freeform shape, or a shell that is not too thick. If not sure, bring several to choose from or see Amy’s selection of fine stones. Materials:. $65 fee paid to instrucor in class (cash/check prefferred) includes two 15g packages PMC3 clay, the use of all tools to finish pendant. 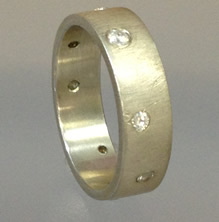 Course description: Add the luster of gold to fine silver fabrications with very little expense. In the ancient Korean technique of keum-boo (pronounced kum-boo, meaning attached gold) pure gold foil is bonded to the surface of another pure metal such as fine silver or PMC. Gold foil is chemically bonded to fine silver in a heat process using heat and pressure. This technique is low tech and easy to do in your home studio. No experience necessary. Suz will also talk about (but not demonstrate) how this can be used on sterling jewelry that has had the fine silver raised. Advanced students may bring a sterling piece with the fine silver already raised if they wish. Questions on how to do this prior to class? Just call or email us at TMAC! 1. a small piece of 20 - 22 g fine silver sheet for experimentation (approx. ¾” x 2”, bring your own or purchase from TMAC) cleaned and sanded fine, or a completely finished piece of fine silver jewelry. Deeply textured pieces are NOT advised. Course description - An in-depth workshop in three days, perfect for anyone who has always wanted to learn jewelry-making but never had the time. Jenifer will cover all of the metalsmithing fundamentals, including sawing, filing, soldering, hammering, and texturing. 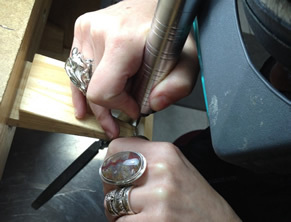 We will also cover bezel setting stones, making stacking rings, and lots of soldering. Students will be guided step by step in the use of studio equipment like torches, hand tools, and rolling mill. The instructor will also talk about how to set up a home studio so you can continue on your own after the class. No prior jewelry experience is necessary, students of all levels are welcome. Small class size of eight sudents ensures plenty of one on one instruction. Copper and brass provided for in class use, silver available for purchase. Closed Friday May 3 and June 14 for Beginning Intensive Class.